The pressure cooker is just another means for the home cook to make some delicious meals often much quicker and easier than using more traditional methods. The pressure cooker does require attention to detail and following the instructions of the manufacturer and the recipe very carefully. There is a potential for mishap with misuse but modern cookers are quite safe and are not subject to the horror stories of the past. 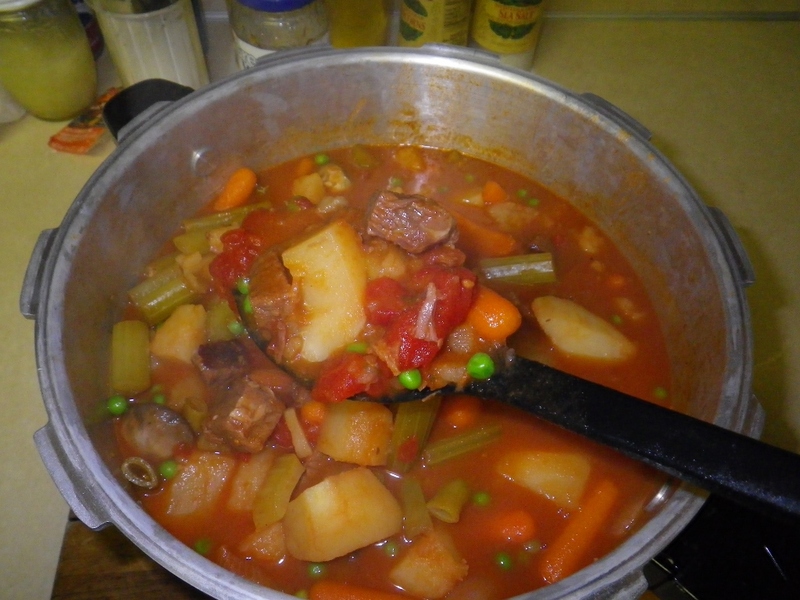 Beef stew is an excellent meal. It is a satisfying concoction any time but is even more pleasing on cold and blustery days. 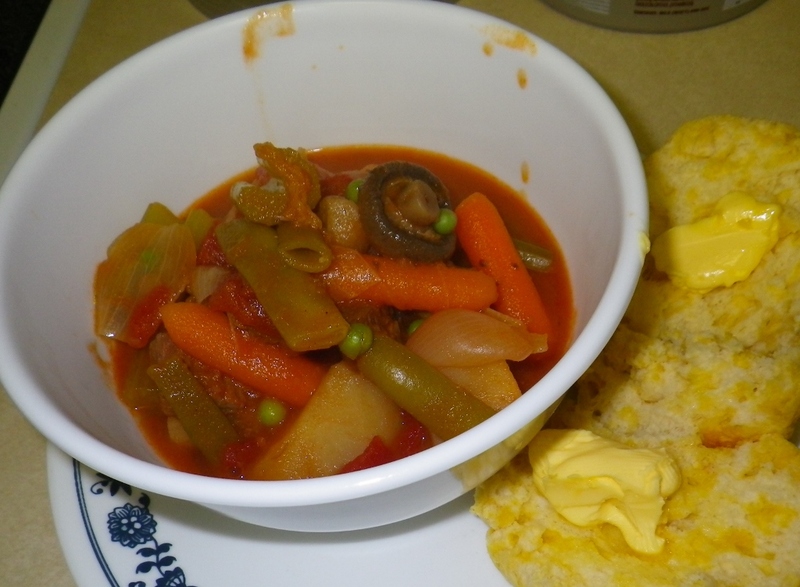 Growing up, I got to know beef stew as red, a tomato based stew made by my father. 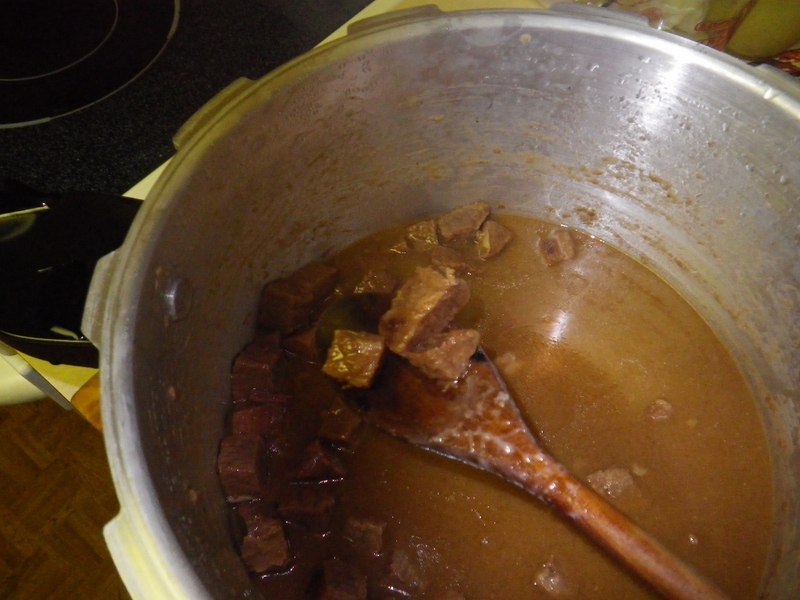 Some years later I got to know beef stew as brown based on a beef gravy. They are similar but so very much different in taste and texture. I like both and may make either depending on my mood. Today’s stew is red, based on tomato sauce and made from a roast I cut into bite sized pieces myself. Some things I have found out: Use small whole or pearl onions instead of quartering larger onions. Whole mushrooms are sturdy enough to survive pressure cooking whereas cut onions are not. Baby carrots are a quick and easy way to add carrots to your stew. Green beans are an often overlooked vegetable for stews. Cook green peas separately to just done, then add to the completed stew just before serving to preserve color and texture. This recipe was made from a roast that we cut into stew pieces. 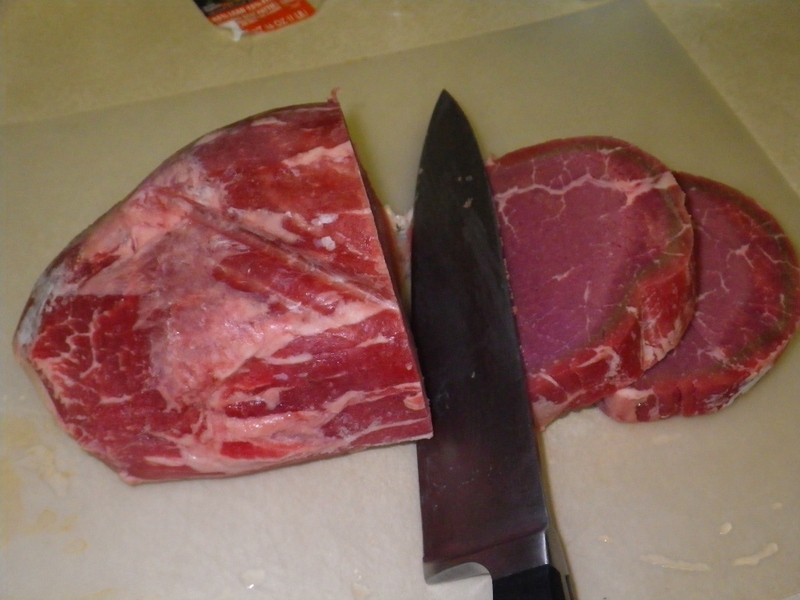 The cost per pound for the roast was less than prepared stew meat. 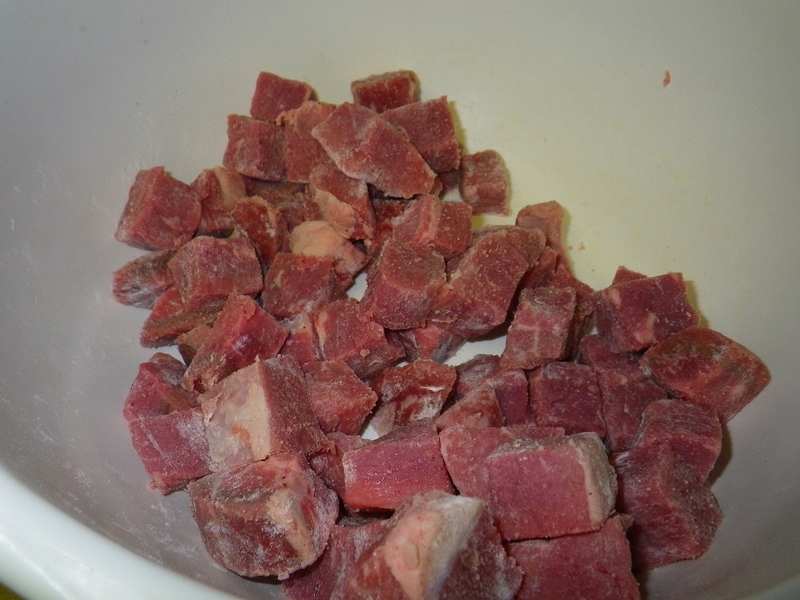 You may use prepared stew meat equally well. Heat the pressure cooker over medium high heat. Add a bit of olive oil, just enough to cover the bottom of the pan. Season the meat both sides with salt and pepper. Brown both sides well in the preheated pan. 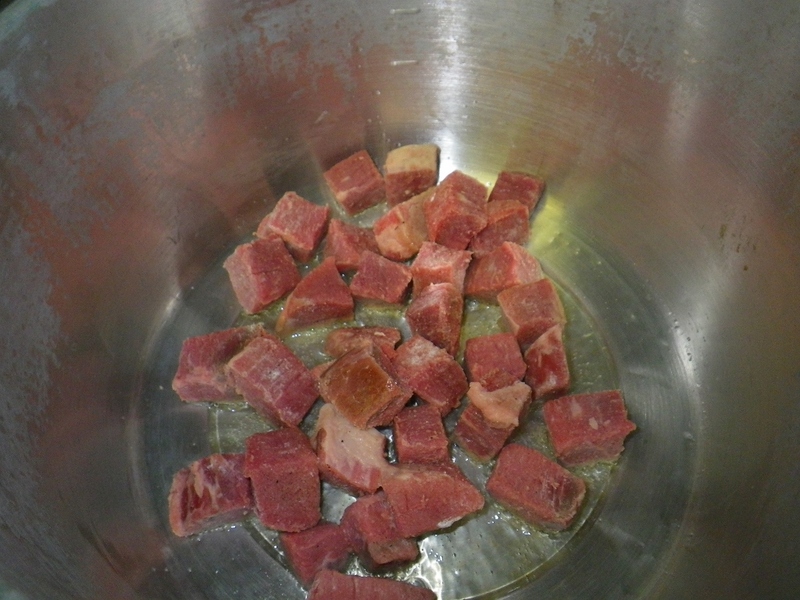 After the meat has browned, cover the meat with the contents of the onion soup mix bag. Sprinkle with a bit of onion powder, paprika and MSG to taste. Add a bay leaf. Add two cups of water. Cover and lock lid in place. Heat over high heat until the rocker jiggles. Reduce the heat to maintain a slow rhythmic jiggle. Cook for fifteen minutes. After fifteen minutes, remove from heat and carefully place the cooker in the sink. Cool with running cold tap water until lock releases and you can open the lid. 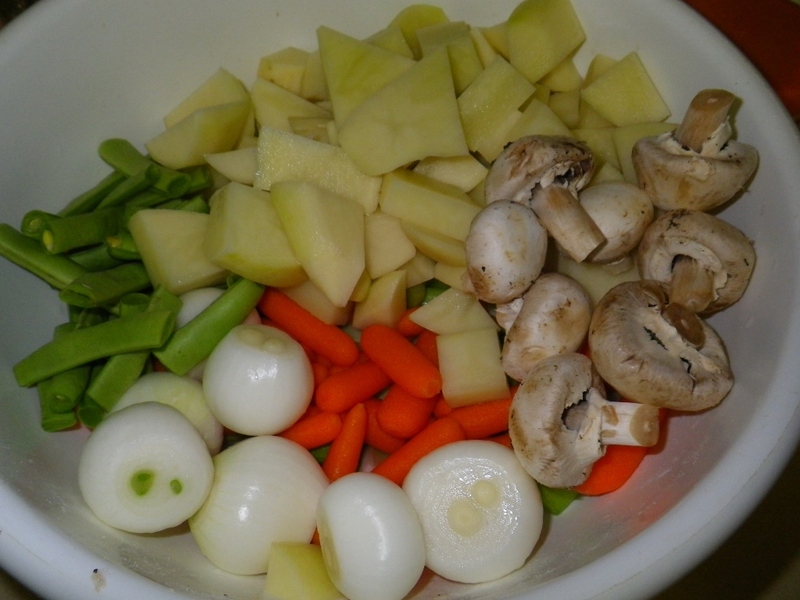 While the meat is cooking, prepare the vegetables; peel and quarter six potatoes, peel and cut six carrots into 1 inch pieces (or 8-ounces baby carrots), trim and string six stalks of celery and cut them into 1 inch pieces, peel 10 Pearl onions. Add one can of condensed cream of mushroom soup and one cup of water to the meat. Add the vegetables (except the peas) over the top of the meat. Cover and lock lid in place. Heat over high heat until the rocker jiggles. Reduce heat to maintain a slow rhythmic jiggle. Cook for just three minutes. Carefully remove the cooker from the stove and place it in the sink. Cool the cooker under cold running tap water until the lock releases and you can open the lid. Remove the meat and vegetables to a serving bowl (careful, the meat will be fall-apart tender) leaving the cooking liquid in the cooker. Make a slurry of two tablespoons of flour in some cold water. 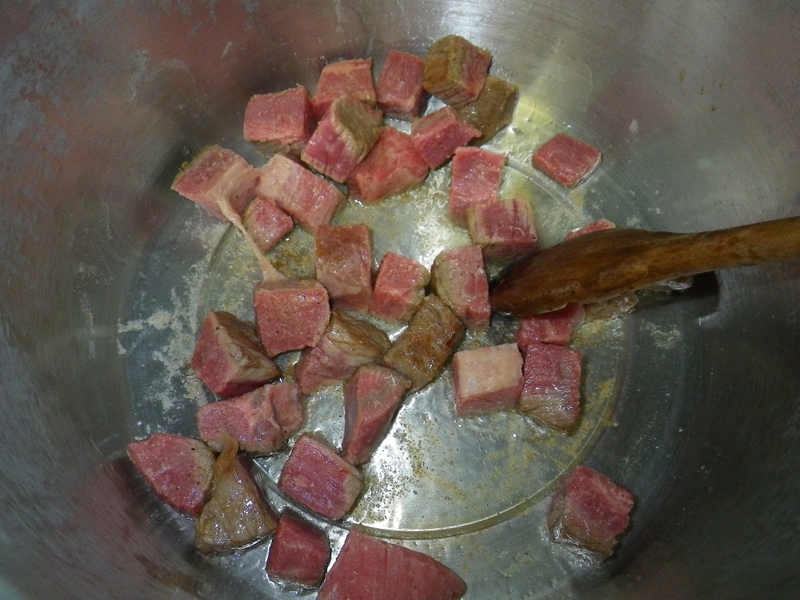 Add to the cooking liquid; heat over medium high heat, stirring constantly until the liquid firms into thicker sauce. 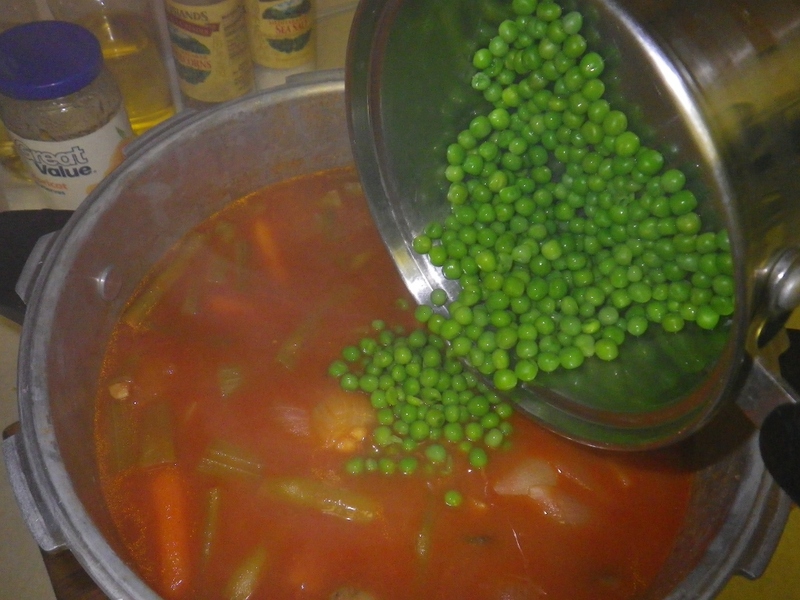 Return the meat and vegetables to the sauce, add the previously cooked peas. Fold to combine, serve.